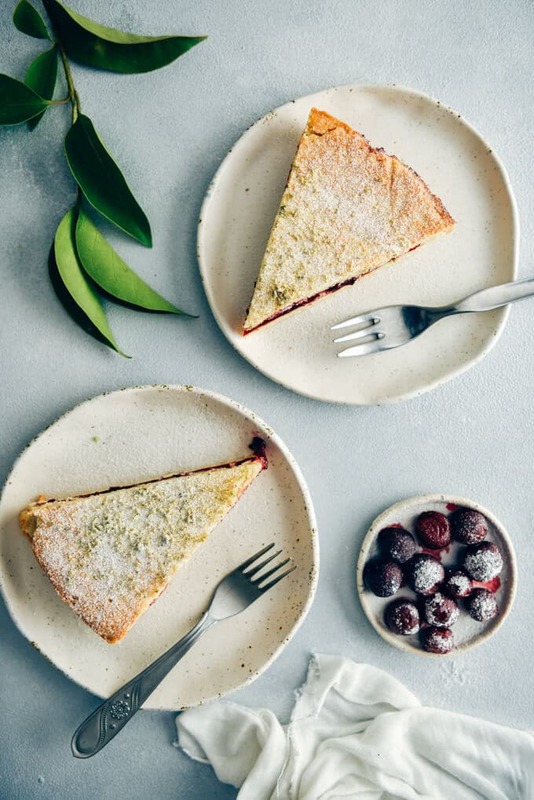 This Easy Fresh Cherry Pie is one of my go-to summer desserts. Everything is from scratch yet so simple. It is made with an easy crust and a simple filling. The only hard part is to pit the cherries but I find it really fun. Raise your hand if you love anything with cherries! Do you like picking cherries from a tree? 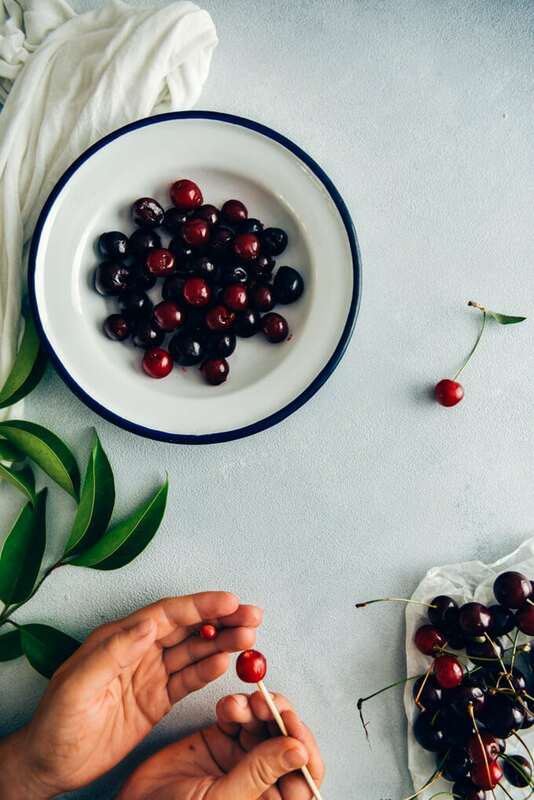 Can you eat cherries all day? Would you like to impress someone with a homemade cherry pie although you are not the best chef? 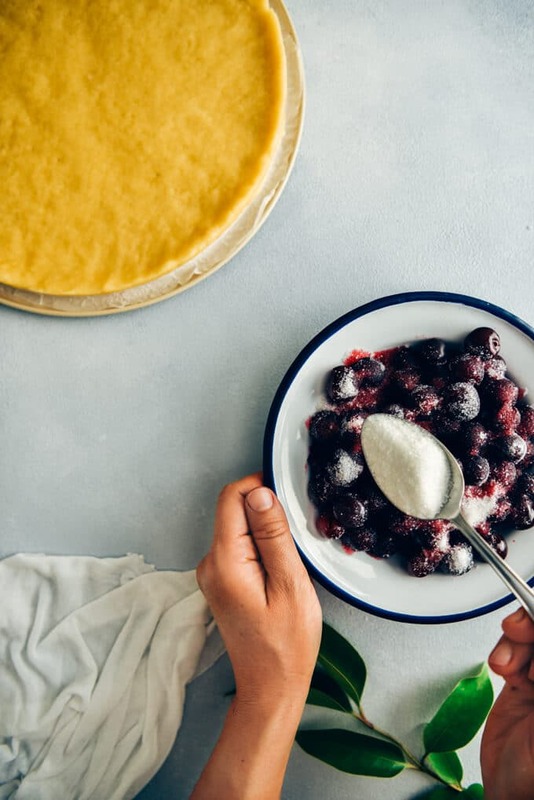 This incredibly easy fresh cherry pie recipe is for you if yes. Just like the Fresh Cherry Crisp recipe I shared here a while ago, this pie doesn’t require baking skills. How Easy Is This Fresh Cherry Pie? Forget about all the tips you need to keep in mind to make a perfect pie crust. I mean it’s not that hard but sometimes we need a much easier recipe which makes us feel more comfortable when following the steps. I’m always in search for easy ways of making pies. Have you seen our Crustless Zucchini Pie? Count me in whenever a pie is that easy to make. This one is an easy cherry pie recipe for two reasons. First, the crust dough is very similar to a regular cake dough, just thicker than it. Thick enough to form a ball and no chilling is required. Second, my homemade cherry pie filling has only cherries and sugar. It is simply a combination of egg, yogurt, butter, olive oil, sugar, flour and baking powder. Whisk together the wet ingredients first and stir in flour and baking powder. Combine well using your hand. Don’t overplay with the dough, your crust gets tough otherwise. Divide the dough into two. 2/3 for the base and 1/3 for the lid. Spread the base dough into a prepared medium spring form tin. Push up the sides to form the edge so that the lid can stick. 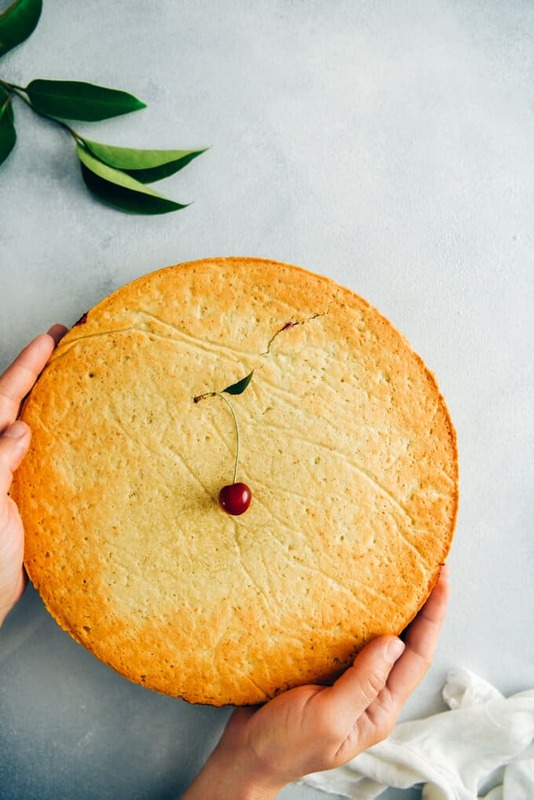 I sometimes divide the dough into two equal portions and use one of to make a one-crust pie like this Fruit and Cheese Pie and store the other half in the freezer up to a month. It doesn’t wait there that long though. I use sour cherries for this recipe because I love their tartness, but you can use sweet cherries too. You may just need to adjust the amount of sugar. Pour sugar over the pitted cherries and let them sit about 15 minutes so that the cherries release their juice. Squeeze the cherries in your hands and drain the juice. Taste and add extra sugar if needed. The filling is ready. So easy, right? If you already have canned cherry pie filling though, you need to go check out Melanie’s amazing Fudgy Black Forest Bars. How to Pit Cherries Without a Cherry Pitter? I know cherry pitter is a great tool. It might help a lot if you need tons of cherries when canning or preserving. However, we can live without it. Right? We don’t have a cherry pitter because I don’t think it is a must have kitchen tool. A chopstick can work really fine to remove the pits. Use the thick end of a chopstick to push the pit out of cherries. An easy and fun method, isn’t it? Fill the pie crust in the tin with cherry filling and roll out the other potion of dough to match the size of your thin. I do this part with my hands but you can use a rolling pin too. Place it carefully over the filling, press the edges with your fingers. Make a cross on the lid using a knife so that all parts bake evenly. Bake it at 350F for 20-25 minutes until slightly golden. Let it cool and remove from the tin. I want my pie to have a flat top, so I turn it upside down but you can just leave it as is. If you love baking easy treats in summer as much as I do, you shouldn’t miss our Peach Cobbler with Cake Mix too. It is a fantastic light dessert with fresh peaches. 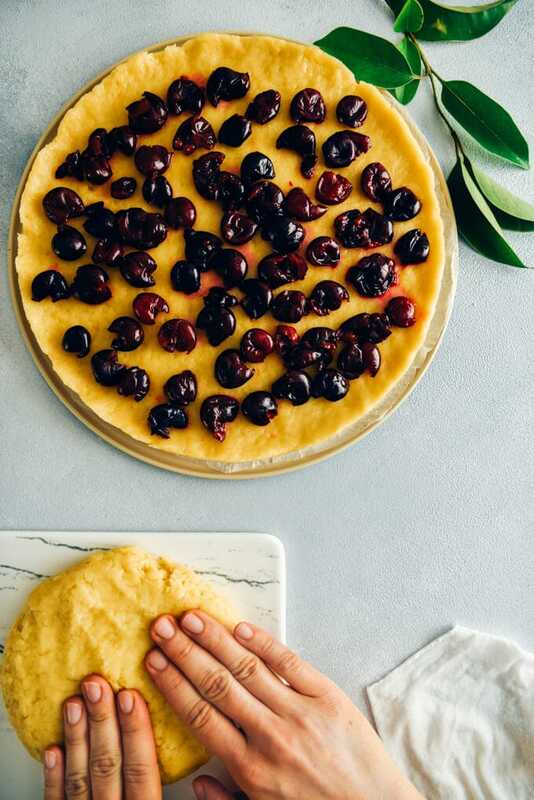 You love cherries but don’t feel like baking? Make Fresh Cherry Avocado Toasts and enjoy this unexpected combination! If you have a chance to make this Easy Fresh Cherry Pie recipe, I’d love to hear your feedback. Please rate the recipe and leave a comment below. Remove the cherry pits using a cherry pitter or a chopstick as mentioned above. Pour sugar over cherries and let them sit for 15 minutes so that the cherries release their juice. Squeeze the cherries in your hands and drain the juice. Taste and add extra sugar if needed. The filling is ready. Preheat oven to 350F. Butter a middle springform pan and put aside. Whisk together the wet ingredients first and stir in flour and baking powder. Combine well using your hand. Don’t overplay with the dough, your crust gets tough otherwise. Divide the dough into two. 2/3 for the base and 1/3 for the lid. Spread the base dough into a prepared medium spring form tin. Push up the sides to form the edge so that the lid can stick. Fill the pie crust in the tin with cherry filling. Roll out the other potion of dough to match the size of your thin on parchment paper so that it doesn’t stick and it is easier to transfer on the filling. Bake it for 25-30 minutes until slightly golden. Let it cool and remove from the tin. I want my pie to have a flat top, so I turn it upside down but you can just leave it as is. Dust the pie with ground pistachio and powdered sugar. Garnish with frozen cherries and serve. Guess I don’t see how much baking powder to use, it’s not listed with the rest of the ingredients. Oh I’m so sorry! I’ve just added it to the list. Thank you so much Peggy for the heads up! You are making everything sound so easy here. I know what I’m going to make with the last cherries we picked from the yard. Thanks! Hi Amy! it is really so easy. I’d love to hear what you think when you make it. It doesn’t get much easier than this. Looks delicious! Thank you Barbara! It was one of the first recipes I tried when I knew nothing about baking.